Thai police have arrested a 28-year-old man holding a fake Turkish passport in connection with the Erawan shrine bombing. Phone records played a big role in yesterday’s arrest . A second raid was also carried out Sunday afternoon. A combined police and military force on Sunday searched a three-storey apartment in Bangkok’s Min Buri district for more evidence that may be linked to the Aug 17 bombings. Pol Col Kanchol Intraram, chief of Min Buri police, said the search, with a court warrant, was carried out on information obtained from a foreign man who was arrested on Saturday in an apartment in Nong Chok district. The information from the suspect suggested that Maimuna Garden Home apartment on Rat-uthit road was where his associates kept their belongings, he said. 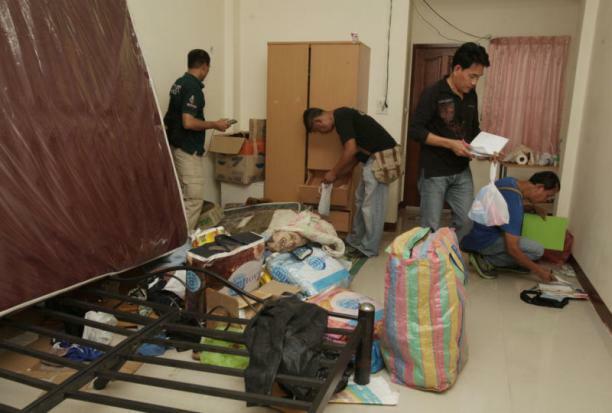 Pol Col Susak Prakamakul, deputy chief of Metropolitan Police Division 3 who led the search, said the force had examined nine of the apartment block’s 30 rooms. The 21 other rooms will be searched after the lessees are contacted, he said. A welding tool, found in in Room No 9102, was seized for examination. Police spokesman Pol Lt Gen-Prawut Thavornsiri just had a long interview on Channel 3 in which he expressed confidence that arrested man was indeed involved in the two recent bombings, but may not have planted either of them. He did not have much new information, but he did say that police are working with a translator to try to definitively establish the identity and nationality of the arrested suspect. He also confirmed that police are requestening a taxi driver who had picked up a suspect about a telephone call he had made. Thai PBS also reports the Turkish Embassy has indicated its willingness to assist the Thai investigation. Below is a long excerpt from this morning’s main story in the Bangkok Post. The audio for the story follows the full text. A police source close to the investigation said the arrest of the foreign man, who is believed to be Turkish, came after investigators spent more than a week sifting through every mobile phone call made within the vicinity of the shrine around the time of the bombing on Aug 17. He said officers managed to identify three Turkish phone numbers which had activated international roaming services and were in use near the blast site. Police apparently traced one of those phone numbers to the suspect apprehended yesterday. Around 100 police and soldiers moved in to make the arrest around 3pm at the Pool Anant apartment building in Nong Chok district, in the city’s eastern outskirts. 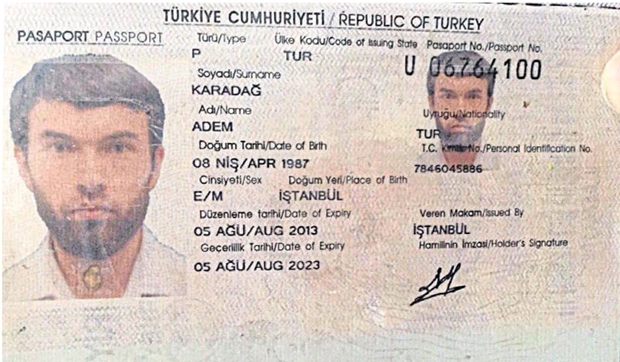 A military source said the suspect held a Turkish passport by the name of Adem Karadag, 28, although the document was later found to be fake. A large quantity of bomb-making materials and equipment which allegedly belong to the suspect were seized from his rented room. 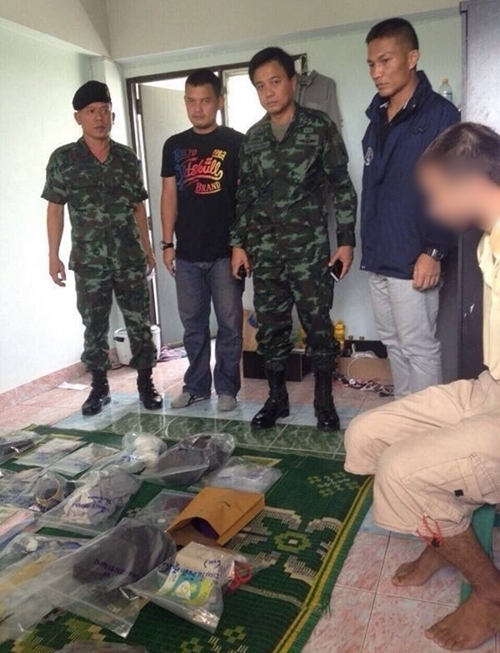 Deputy national police chief Chakthip Chaijinda said “many” passports had also been found in the suspect’s room. They were confiscated as evidence and would be tested for authenticity. Pol Gen Chakthip said it was unclear if the suspect is the same man seen on CCTV footage wearing a yellow T-shirt and depositing a backpack at the Erawan Shrine minutes before the bombing. However, sources in the Metropolitan Police Bureau and the Crime Suppression Division said the suspect is not believed to be the bomber. Instead he is believed to be one of three individuals involved in orchestrating the blast, which killed 20 people and injured 130. Authorities have linked the incident to another bomb which exploded in the water near the Sathon pier the following day. There were no injuries. The police sources said the detained suspect is believed to have delivered the bomb to the suspect in the yellow T-shirt at Hua Lamphong train station, shortly before the bomber caught a tuk-tuk to the shrine to plant the device. The sources added the Erawan Shrine and Sathon pier bombers may have already fled the country. The detained suspect possibly remained in the country because he has problems with his travel document, the sources said. Even passing inspection of the fake passport showed several inconsistencies, the most notable being that the “date of expiry” line had been printed twice. A poor-quality forged passport. Note the two expiry dates. The suspect has been charged with possessing explosives without permission, said national police chief Somyot Poompanmuang. He was remanded in military custody at an undisclosed location yesterday after being briefly detained for questioning at Nong Chok police station. Before that, officers had searched five rooms at the apartment complex, four of which proved empty. 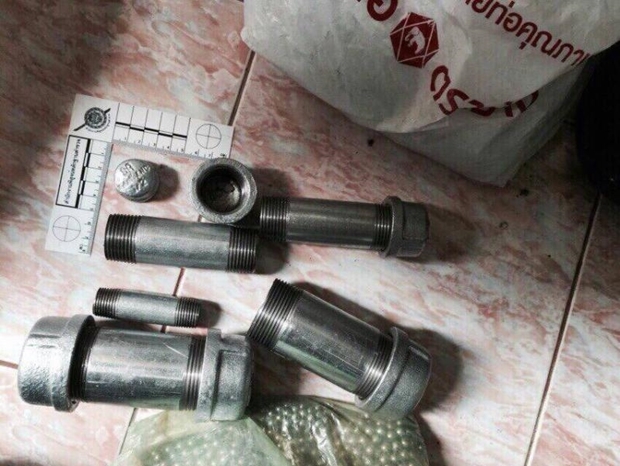 Crime Suppression Division commander Akkaradech Pimolsri said bomb making equipment and parts were found in the suspect’s room, including large packs of 5mm ball bearings, the same as the type used in the two bombings. Also recovered were a detonator, batteries, electrical wires, a metal pipe, chemical containers and a gunpowder-stained shirt. 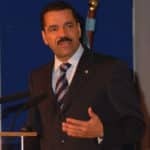 A police source said rental contracts showed all five rooms had been rented by a male Turkish passport holder named Ammet Mehmet Emin Ayse on January 27 last year. Local residents living near the apartment building told reporters the suspect could not speak Thai and mostly kept to himself. Sometimes, he and several friends would eat at a local food stall. Post Today reports tonight that five rooms were rented out in the apartment under the name AHEMET MEHMMET EMIN AYSE. Police have released more photos of materials found in the apartment and they do look suspicious indeed. It seems quite possible that members of the group involved were planning more attacks. In a surprisingly short (3-minute) statement, Police spokesman Pol Lt Gen-Prawut Thavornsiri confirmed that a foreign national of unspecified nationality has been taken into custody and is believed to be involved in both the Erawan shrine bombing and the Sathorn pier bombing. Pol Lt-Gen Prawut also showed photos of various bomb-making materials found in the apartment, including detonaters and a steel pipe. The man, the police say, may not have planted the bombs, but he is part of the network that carried out the operation. Post Today reports that Thai police have arrested a young man in connection with the Erawan shrine bombing. 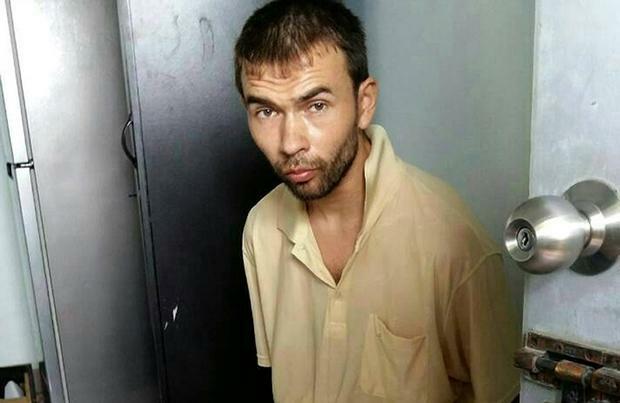 He reportedly holds a (fake) Turkish passport. According to the report, Thai police raided an apartment on Soi Chueam Samphan 11 in Bangkok’s Nong Chok district about two o’clock this afternoon, arresting its occupant. The reports also say bomb-making equipment was found, including ball-bearings very similar to those used in the Erawan shrine bombing. The scene in Nong Chok outside the apartment at midday. No-one is being allowed inside. Post Today photo. Post Today reports that national police chief Somyot Poompanmoung said plainclothes police were instrumental in tracking down the suspect and that others were involved in the plot, possibly some Thais. Thai Rath reports that about 100 police and soldiers were involved in the operation and they surrounded the apartment before moving in. Thai PBS, reporting from outside the apartment, says the suspect first rented the room (412) on July 21. The owner became suspicious and alerted police which led to today’s raid. Voice of America reporter Steve Herman has tweeted that police informed him that the suspect is 28 years old and is apparently from Istanbul. The PBS has just reported (5:30pm) that the suspect has been taken away from apartment and will undergoing intensive sources Meaning: extremely thorough; done with a lot of care; involving a lot of work or activity done in a short time questioning. His nationality has not been confirmed. Police have scheduled a press conference for 6pm.